Claudin Destine and the radiology staff perform a CT scan on a 4-week-old NICU patient. 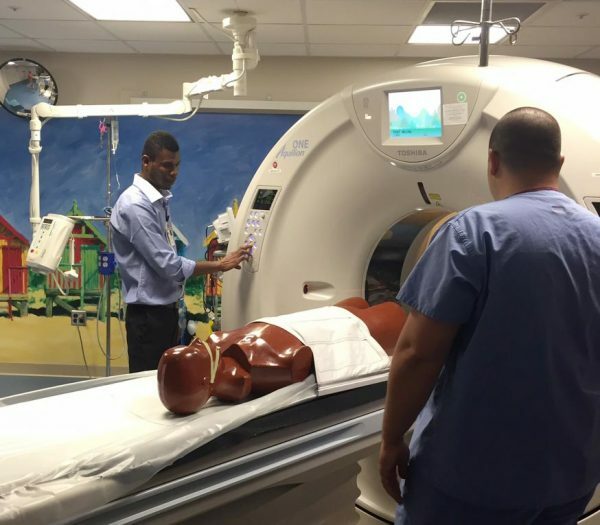 Claudin Destine is a radiology technician at St. Damien Children’s Hospital in Haiti. Claudin and 6 of his colleagues are spending 5 weeks training in their respective fields at Akron Children’s Hospital. 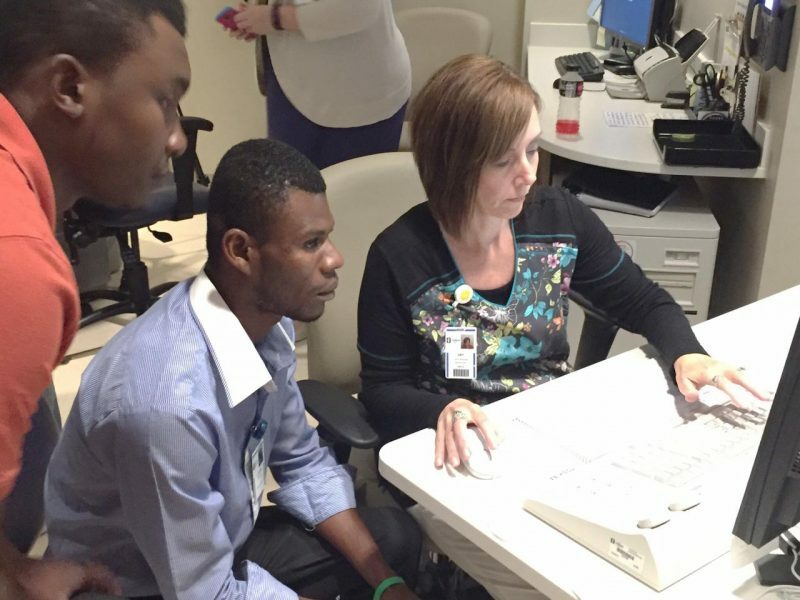 In September, the Akron Children’s staff who works closely with them in Akron will travel to Haiti to complete the cycle and further their training and education at St. Damien. This program is supported through a grant from Rotary, which shares Akron Children’s vision of empowering our Haitian colleagues to care for the children of Haiti in a sustainable way. In some ways I am like a child being raised by St. Damien and Akron Children’s. As a child your brain is blank and through training and repetition, you are able to learn new skills. St. Damien recognized my potential and chose me to participate in this life-changing opportunity. Claudin Destine simulates a CT scan on a mannequin. The CT staff at ACH has been incredibly patient with me and taught me new concepts — including how to use the machine, anatomy and much more. Even though I don’t speak English, they have been accommodating and make every effort to ensure my understanding. They take their time and reinforce concepts that are difficult to comprehend. The things that I am learning will help me serve countless patients in my country of Haiti. I can never thank you enough and will not stop seeking the knowledge of the wise and understanding. To the staff in CT: A huge thank you. Keep up the good work! You aren’t told thank you often enough. I am also thankful for the courage and strength of everyone who participated in arranging this training. Read about the experiences of Edna Benjamin Pierre Louis, who is also shadowing in Akron and is the director of nursing at St. Damien.